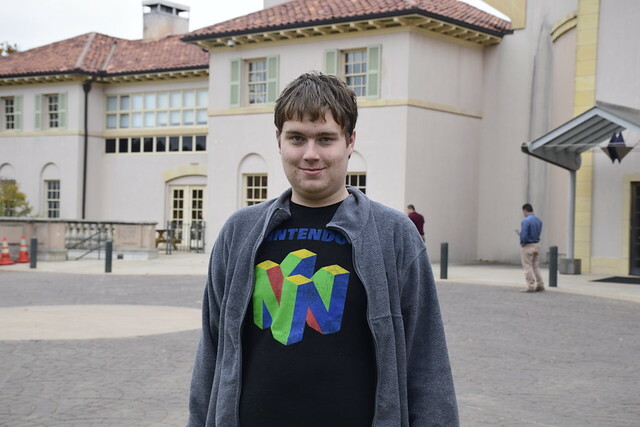 Sunday afternoon, after setting the DVR for the Dallas Cowboys game, son Logan and I headed off for an outing at Tulsa’s Philbrook Museum of Art. I wasn’t interested in the art on this trip as I was the gardens of museum. They have spectacular gardens and there is something to see in them all seasons. Thanks to Logan’s grandmother, my MIL, who buys us a family membership every year, we get to go see Philbrook a lot. First up they had a Special Exhibit called “Museum Confidential” that was about, among other things, why some works that museums have in the their collections never get exhibited. They had a pretty dense display of Philbrook owned art that never gets displayed. A lot of it is funny looking, or worn out, or they are not sure exactly who painted it (provenance that is called). I thought it quite interesting. My theory is that a lot of stuff is donated and they don’t know what to do with it. My dad was involved in a museum in Idaho and he talked about all the worthless stuff people donated just to get a tax deduction. Anyway, we checked the exhibit out in a couple minutes an then toured the rest of the three floors in about 15 minutes. It doesn’t take me long. I have been to the museum dozens of times and I just like looking at the stuff I like and it is like saying hello to old friends and I never get tired of the collection, and every once in a while I notice something new or rather, noticed something that has been there all along. So, after our whirlwind tour we headed out for the gardens. 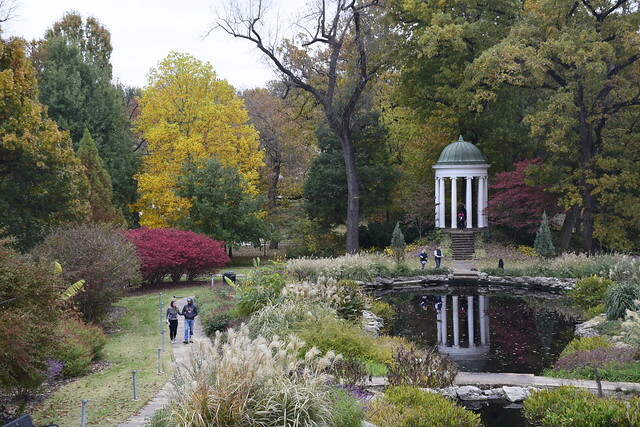 The focal point of the gardens is the tempietto. 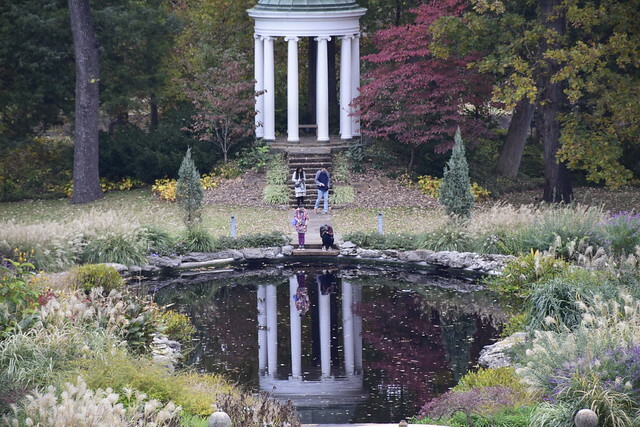 The money shot is the tempietto reflected in the pond. I wonder how many photos have been taken of it over the years. I think it has led to an imbalance of photons in this world that is causing many of our current problems. So I know that it is somewhat of a cliche but you know I have been clicking away for years and will keep on clicking. I think the scene is gorgeous. And then we went off. I found this foliage right next to the employee parking lot. I’ll take it. By now you have figured out that I have a thing for curved walkways that go underneath colorful trees. And on our way out, I stop for another shot of the tempietto. I like all the purply colors in this scene and how the colors are reflected in the pond. I also love all the textures in the scene. 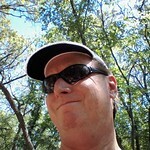 I am not bragging about the photo, I love the what my eye sees and what is weakly captured by the camera. 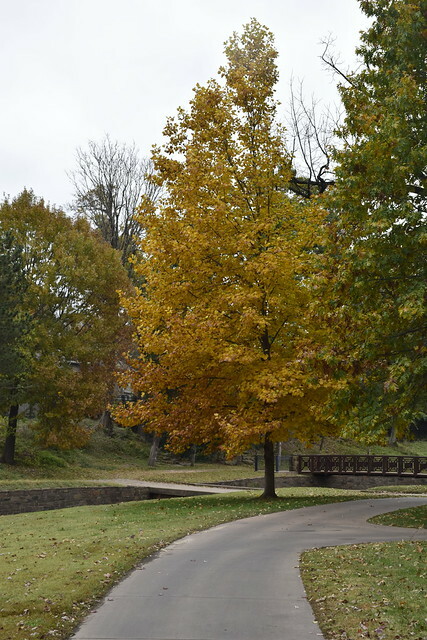 If you plan on visiting Philbrook check their website. They have lots going on including both big special exhibits and smaller. Note that they have a monthly event called Second Saturday where the museum doesn’t charge admission and they have all sorts of activities for all ages. it is quite fun and is sponsored by my employer. They are also very photo friendly. You can take photos of almost anything in their permanent collection. Just don’t use flash and don’t be a pain to your fellow guests. 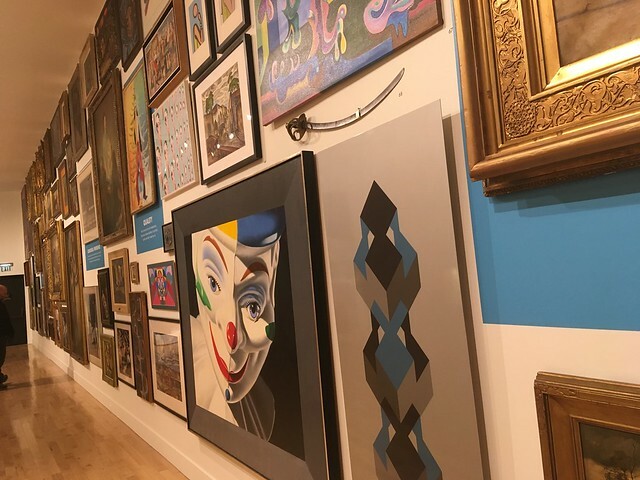 Special exhibits are sometimes different because they bring in art from other museums and private collections and sometimes there are restrictions. If you have any questions, just ask the people at the front desk. They are very friendly, well trained and can answer all your questions. 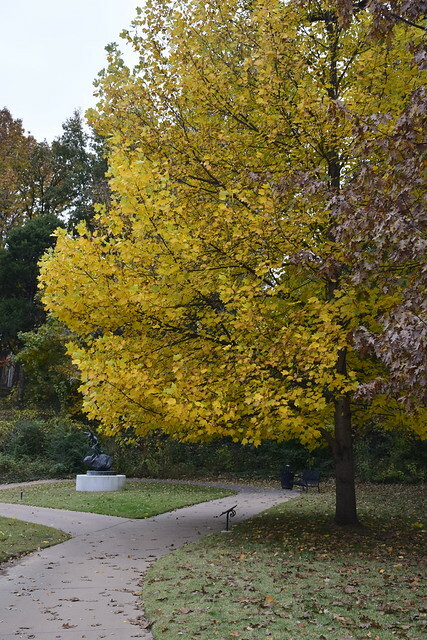 This entry was posted in Philbrook Museum of Art and tagged Autumn, Fall Color, Fall Foliage, Gardens, Museums, Oklahoma, Philbrook Gardens, Philbrook Museum, Tempietto, Tulsa on November 13, 2017 by Alan Bates. A lot of trees have lost their leaves and a lot still have their leaves on in like a last second burst of glory. 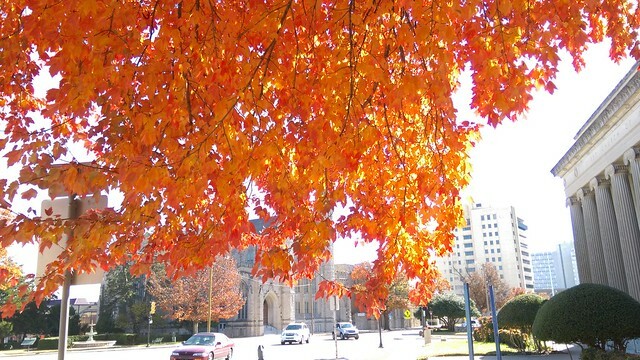 I found this tree just south of downtown earlier this week. I loved the view underneat the leaves with the sun shining through. 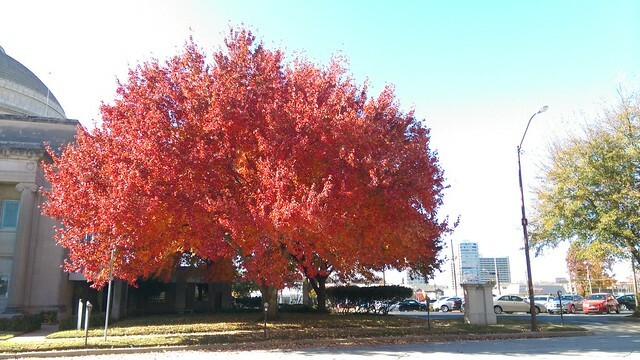 The same tree a few minutes later across the street and it has a decided more reddish appearance. What’s the deal!!?? 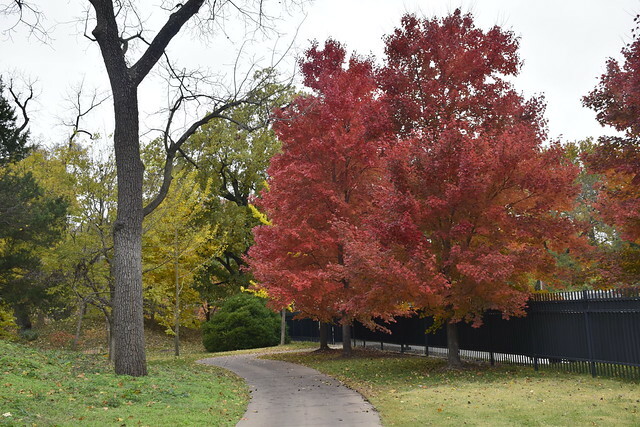 This entry was posted in Tulsa and tagged Fall Foliage, Oklahoma, Tulsa on December 2, 2016 by Alan Bates.